Though you may feel tempted to try the popular fad diet known as the cabbage soup detox diet, many medical professionals say this extreme regimen won't offer long-term benefits. "People will lose weight in the short term, but nobody can stick with it," John Foreyt, Ph.D., a weight-loss expert at Baylor College of Medicine in Houston, says on the website Health.com. Several variations of the cabbage soup detox diet exist, though the basic regimen for most versions of this diet revolves around drinking a few cups of a cabbage soup mixture every day for seven days. On "free days" dieters may also eat small amounts of other foods, mainly fruits and vegetables. Various publications promoting the cabbage soup detox diet claim that a person can lose up to 10 to 15 pounds in one week by following the diet plan, notes the University of Florida News. 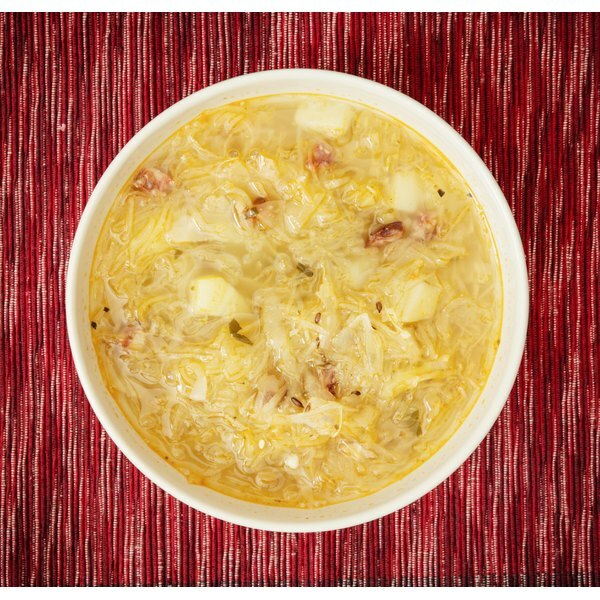 Each cup of cabbage soup contains only about 66 calories, according to Health.com. On day one of the diet, a person may consume as little as 860 calories eating mainly soup, fruit and a glass of milk. Even as the diet progresses to include portions of fish or chicken, dieters still only consume a little over 1,000 calories per day, far short of the suggested 2,000 calories per day for most healthy adults. In some instances, dieters may drop to below 800 calories per day on this calorie-restricting diet. Detox diets such as the cabbage soup diet claim to help your body flush out toxins, though some medical professionals criticize the importance of detoxing. According to gastroenterologist Nasir Moloo of Sacramento, California's Capitol Gastroenterology Consultants Medical Group, most healthy people's kidneys, liver, lungs and skin already provide plenty of detoxification. "Your body does a perfectly good job of getting rid of toxins on its own," says Moloo on MSNBC.com. "There’s no evidence that these types of diets are necessary or helpful." Elaine Turner, a nutritional scientist at the University of Florida's Institute of Food and Agricultural Sciences, warns that the cabbage soup detox diet may aggravate health conditions in some people, such as those with diabetes. "Consult your physician before beginning any new diet, and that goes double here," says Turner. Fasting and crash dieting also deprive your body of many necessary nutrients, and in the long term, these types of diets may weaken your heart. Short-term side effects can include fatigue, headaches and irritability. Because so many dieters eventually regain the water weight lost during the cabbage soup diet, those looking for long-term results should consider a healthier approach to weight loss. Nutrition consultant Susan Moores, an American Dietetic Association spokesperson, suggests on MSNBC.com that you cut back the amount of high-fat food in your diet and follow a balanced meal plan that includes plenty of vegetables and fruit. Jessica Taylor has been writing professionally since 2007. She has contributed a number of articles online on topics ranging from fashion to technology to travel. She has a bachelor's degree in English literature from the University of South Florida. Are There Benefits to a Liver Cleanse?